Whether you are starting or growing your business, the first step should be to develop a good business plan, which will be a guideline to keep your thoughts organized. 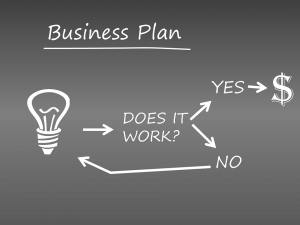 Any business plan is unique and it should be flexible, according to your business industry. There are many free templates, online tools and websites that could help you to brainstorm about how to plan for your business. Here we want to share with you some Documents and Resources that we think might help you to develop your unique Business Plan. Business Plan Template (SCORE) This is a comprehensive and detailed template that will guide you step by step, explaining concepts in an easy way, and includes simple worksheets for every part of your business plan. Business Plan Template (BPLANS) This template has been used by universities to teach entrepreneurs how to start businesses. It includes samples of charts and statements to show your financials. Business Model Canvas Poster Canvas is a one page template that helps you to have a visual chart of how you plan looks like, including key partners, key activities, value proposition, customers, and finances. SBA’s Build Your Business Plan Tool: The U.S Small Business Association provides this step-by-step guide that allows you to save and update your business plan. The SBA also offers learning resources for small businesses through its Learning Center. Canvanizer: This web page provides you with Model Canvas templates for Business Plan, Service Design, Project Management and SWOT Analysis. If you want to get paid options for online tools, you can try Enloop for detailed forecasting, or LivePlan, which offers a friendly guide and performance tracking. 5 Reasons you need a Business Plan for Long-Term Success: If you are asking yourself if you really need a business plan or is writing the best use of your time, take a look to this article. After finishing, read this a Beginner’s Guide for a Business Plan. SBA How to Write a Business Plan -Video: Tired of reading? Do you prefer a visual explanation on what a Business Plan is? Take a look to this video from the SBA. Entrepreneur’s Elements of a Business Plan: This article describe the seven essential sections of a business plan and suggest what you should and what you shouldn’t include. This web site has a lot other interesting articles for your business. The ProsperUS Detroit Entrepreneur Training program offer a comprehensive, 20-week entrepreneur training program that helps participants realize their potential and develop a business plan. Through this program, we look to our entrepreneurs to be examples, leaders, and potentially employers, in these communities as business owners. ProsperUS Detroit accepts applications to the Entrepreneur Training program on a continual basis. As new classes approach, we will reach out to applicants to gather more information and schedule interviews. If you’re interested in our program, please apply online now or visit one of our Community Partners. To learn more, please contact ProsperUS Detroit. Para aplicar en español favor de bajar la aplicación, imprime la solicitud y envíe a 2835 Bagley, Suite 800, Detroit, MI 48216. También es aceptable entregar la aplicación en persona, nuestra oficina está ubicada en el segundo piso en el mismo edificio de la Secretaria del Estado.